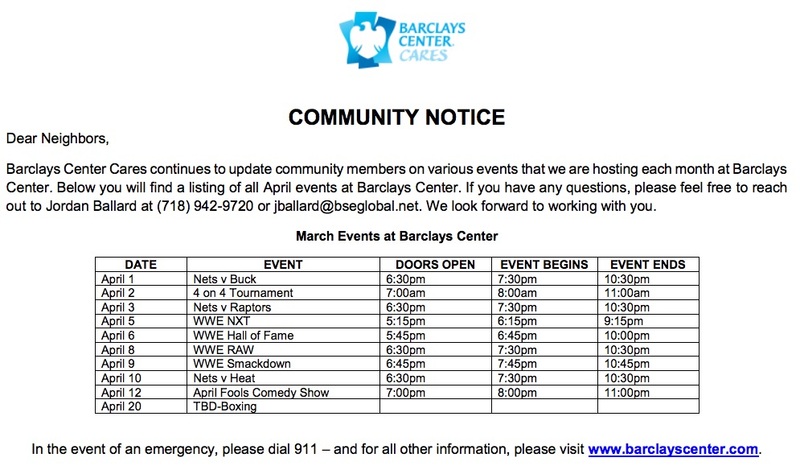 The Barclays Center yesterday (late) circulated the April 2019 calendar to community members. The ticketed events include three Brooklyn Nets games, four wrestling events, one comedy show, and one boxing card. The calendar also mentions a 4-on-4 tournament, presumably basketball, held yesterday morning; I saw no mention of tickets sold. There are several late-month dates left open for basketball and possibly hockey games. The NBA playoffs begin April 13 and, as of now, the Nets have a slot. But their eligibility could be decided in their last game, on April 10. The NHL playoffs begin April 10, and the New York Islanders already qualify. They will play their first round of home games at the Nassau Coliseum and, if they advance, then play at Barclays Center. 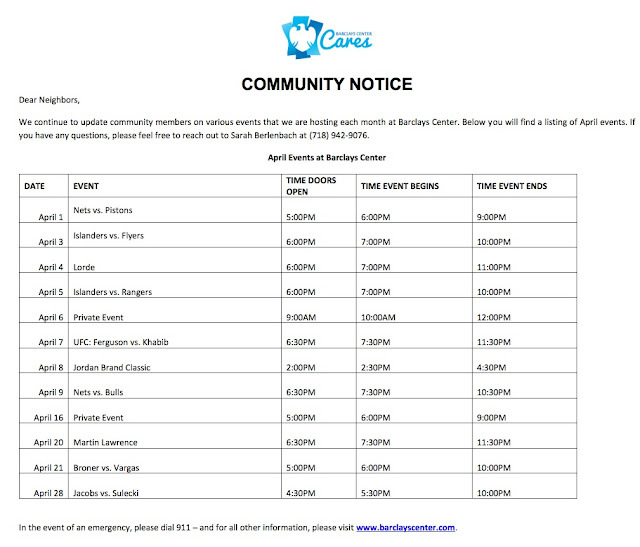 Note: after previously announcing private events, then taking them off the schedule, and then restoring them, the arena is again failing to announce all such events, which can bring disruption to neighbors, depending on size and timing. UBCF’s April 3rd Community Outreach and Pink Bag Event® at the Barclays Center is the event is free for EVERYONE! UBCF will be offering Breast Health Education, Cancer Prevention Information and Pink Bag giveaways. Learn the Self Breast Exam, get a "feel" for healthy and abnormal breast tissue! Enjoy live entertainment, delicious food and fabulous Pink Bag Giveaways! Meet retired NY Yankee and 2-time World Series Champion, Jim Leyritz! In April 2018, there were ten ticketed events as well, plus a couple of private, nonticketed events that were not specified. (I figured out that one was a charter school rally.) However, neither the Nets nor the Islanders made the playoffs.